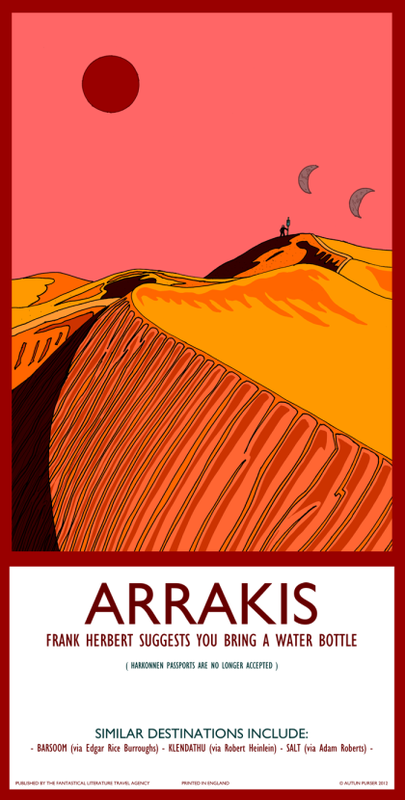 Second in my short series on Tolkien Travel posters (following up on Nana Leonti) is Autun Purser who has done a whole series on “Fantastic Travel destinations.” If you love Dune, Cthulhu, Riverworld, 2001 – A Space Odyssee and more you should definitely stop by his shop to get yourself some of the amazing work he has produced. I can’t really decide what to go for first 😉 I might actually go for Amber, to be honest. What made you do those posters? Well, I started the series for several reasons. I travel a lot for work (I am a deep sea marine biologist, working for a German university in Bremen), and when I travel I often read sci-fi and fantasy. I am also very keen on 1940s and 1950s design. A few years ago I bought a British Rail travel poster advertising the joys of ‘Scarborough’ – a northern England holiday destination. After sitting below this poster and having dinner for many months I thought, hey, why not design posters advertising travel to locations in fiction, in the same vintage format? As with the initial travel posters, I maintained a limited color palette and a strict set of fonts throughout. It started as a little hobby and became an overriding obsession. Are you a Tolkien (fantasy/scifi) fan? I am a big Tolkien fan, and one of my greatest childhood reading memories is sitting in a garden in Cornwall (where I was then living) and reading Fellowship of the Ring avidly. At the age of about 10 Radio 4 played the fantastic 13 part Radio drama out again in the UK, and I recorded each episode religiously on C60 tapes. I must have listened to each of them 100 times. 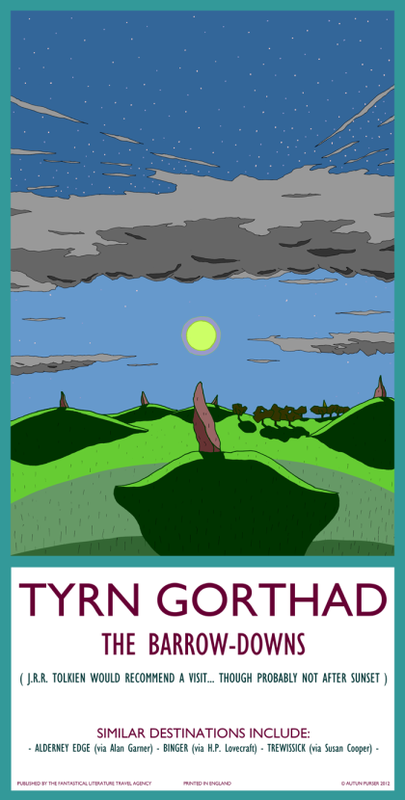 So, as a big Tolkien fan I really wanted to include a location in this series. I didn’t however want to put in a location which had turned up in the movies, or even in the radio adaptations. I always liked the Barrow Downs section of Lord of the Rings, so I selected that for this poster. I also liked the quietness of the place, which I tried to put in the illustration. The shapes of the trees in my picture are similar to the type Tolkien himself would draw, so a bit of a homage there. Will you do more in the future? I am going to continue my poster series in general. I have had great feedback at events and via the internet. People are demanding Ringworld, a book I liked that I didn’t realise was still so hugely popular. I have also had many calls for China Mieville stories. Neil Gaiman himself said I could do something from one of his, so I probably attempt Neverwhere. One thing I want to do with the series is maintain a reasonably high percentage of posters advertising locations for lesser known books. I think part of my self imposed remit is to draw attention to these partially forgotten books. Here is a quick list of some locations either pencilled out or underway: The Mountains of Madness, The World in Winter, The Hall of Bright Carvings, Ringworld, Grendon’s Farm, Innsmouth, World of Tiers. Have a look at Autun’s website for all of his work. Visit his shop for a full list of his Fantastic travel destinations. [su_box title=”Artist bio” style=”glass” radius=”8″]Autun Purser is a deep sea marine biologist working at a German university in Bremen. Pictures used with kind permission. There’s a mistake in your “Barrow-downs”poster. Alan Garner’s spiritual home is not “Alderney Edge” but “Alderley Edge”. Alderney is one of the Channel Islands. Thank you very much for your feedback – I will pass this on to the artist!